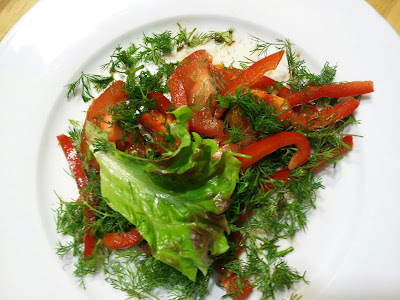 Dill salad... I just love it! Dill! More dill! I've been working on my waistline for a while with almost no results. Over the holidays I put some extra three pounds and they all perfectly settled on my waist. It took me three weeks to get back to my pre-holiday weight. But that "doughnut" belt is still there. I eat clean, I exercise, I control my portion. Why is that stubborn "doughnut" not melting down? After referring to my fitness "advisor" Oxygen, I decided to change my cardio routine and drop sugars. I've heard of benefits of high-intensity interval exercise (HIIE) and decided to incorporate it in my workout for next eight weeks. I follow the recommended frequency ratio 1:3 (30 seconds of sprint followed by 90 seconds recovery jog). And my goal is to be able to repeat this cycle 8 times. So far I can complete 4 cycles at this ratio. Another advise from the Oxygen was to drop sugar intake to only sugars that naturally exist in fruits and vegetables. I signed myself for one sugarless week. Even though I don't have a "sweet tooth", it is more challenging because sugar is everywhere!!!!!!! Oh well, it's already Wednesday, and I am OK so far. I just need not to think about any dried fruits, a jam with my afternoon tea or a chocolate for a few more days. 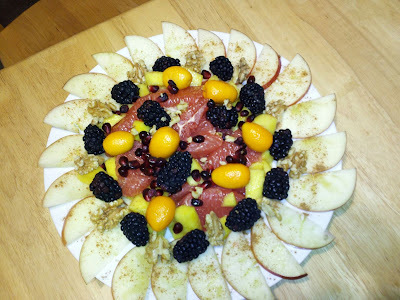 Here's how I deal with cravings: I make a fruit plate with walnuts and sprinkle it with some cinnamon. Fresh apples with walnuts and cinnamon is my new favorite snack. Do you have any cravings? How do you deal or "dill" with it? Wow, good for you! I have struggled with discipline all my life! While I don't eat a ton of sugar - I can't imagine going sugar free! Your fruit plate is stunning and I'm sure that helps the cravings! Thank you Ann. I am OK, I think after tree days it's just getting better. Marina, you are on the right track. I am also going to try HIIT once I am done with marathon training. As far as cravings are concerned, I am a bad advisor. So far I've fed my body whatever it wants and called it intuitive eating instead of cravings :) For some reason I can't comment on your blog from my docrunsforhealth account! But at least somehow my comment will reach you !! I love HIIT, gives me so much energy in the end! And knees don't hurt. Let's look at your account settings after you come back so you can comment here with no issues. That fruit plate looks like a great substitute for sweets. I usually eat my apples with peanut butter. I think it's my favorite fruit snack. Thank you Kristen. I can't eat peanuts, somehow never liked it. I am a walnut person, just love it! I am on diet this period as well. You have no idea how torturing it is to cook for the others and not being able to eat them. Awful! I crave of chocolate many times during the day and i do exactly what you did, prepare some fruits to just make me forget. Dear Katerina, I know what you are going through. We are in the same boat! I have to cook a few meals per day for my non-vegetarian part of the family. Thank you for sharing your experience.